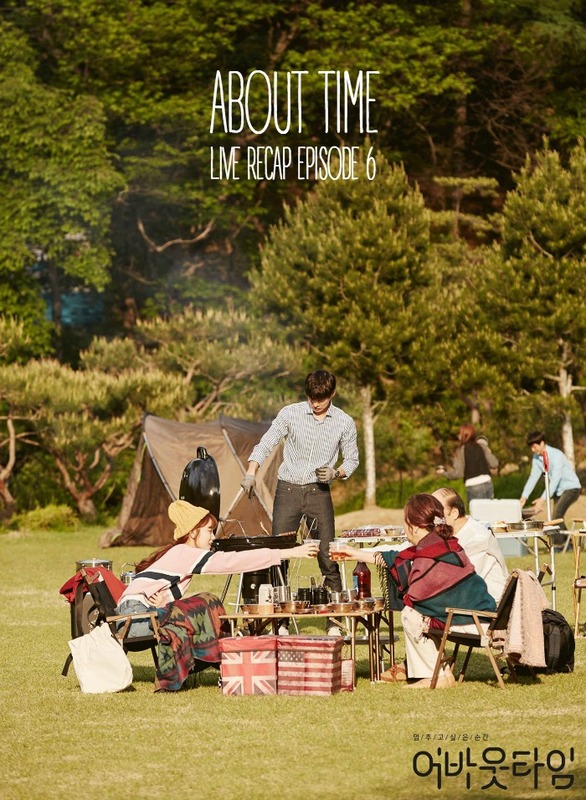 Can we have a drama that is all about camping because I think I would love that. I hope this camping excursion lasts a bit longer into today’s episode. I feel like About Time is so traditional in it’s dramalandness with all the tropes flying around everywhere, but that one addition of seeing peoples’ time clocks just adds that little bit of extra that makes it fun. Also, her best grandma friend can see time too! Who saw that one coming? That completely caught me by surprise in the best kind of way. Now what is this writer going to do with it? How we do this: We update the post around every 10 minutes. Sometimes sooner, sometimes later depending on the scene. There will be typos which we have fantasies of fixing once the episode finishes airing. Also, there might be updates at the bottom, so check back in! DH will live for 61 more years. This is a gift that can be painful. Cut to MC dancing for SN in the hospital as she practices for her musical. It is SN’s own private dance performance in the hospital hallway. After camping, SN rides in the backseat of DH’s car and texts her boo that she had a great time. Then she comments on how much of a light weight DH is. How can be be passed out with one drink? They get to the hospital promptly. MC gets out to drop SN off at her room, DH is left in the car sleeping. Inside, MC asks SN why she won’t go home. SN says it would be lonely there, at least there she sees people. She likes it there. MC mentions that her son sends money but doesn’t visit, she will give him a hard time later. SN just holds her wrist and tells MC that all the good things and bad things just come with life. Human’s make everything. Praying and loving someone make nightmares and miracles. MC wonders what she is talking about all of a sudden. SN says she is just getting old, sometimes she wants to say nonsense like this. They say there goodbyes and SN watches MC walking away. She says that she can see it, but it is best not to see it and just live like others, what can she do? Halmoni goes upstairs and walks past a patient who has 106 days to live. She stops and sits next to the patient. This woman has a pancreatic cancer diagnosis. SN tells her it is okay, it will be okay. She hugs the woman as the woman cries. MC looks at her time clock and is flabbergasted to notice that she has more time. She wonders what in the world is going on but more than that, she likes it. She looks over at DH’s room. In DH’s room, he sleeps with a smile and wakes with a smile. MC goes tot he kitchen for a drink and looks at her wrist again, she added 7 hours to the clock from last night. DH comes in and says that her smile is suspicious, did you come to my room last night? My back is a little heavy as if someone hugged me last night. MC is all like, um what are you talking about? Now they are both confused. Was it a dream? Did I sleep walk? Was it just a dream? MC is all like, of course it is a dream! Even if it is a dream, I wouldnt go to your room. DH laughs and says he didn’t say she went to his room to hug him, it just felt like it. But MC wants to be firm and tells him that they should get locks on their doors. She walks off with a snoot. RH and MC’s brother are sitting at home dumfounded by a man in their living room who is telling him that they can give them a lot of money and cars and everything. It looks like this guy was sent by DB. Cut to SB in her office. She waxes poetic for a second before CA comes in. She greets him perkily and happily. In DH’s room, DH wonders why CA or SB is playing with him. DH thinks SB is behind everything because CA will not give them a contract unless they work with SB’s company. Cut to CA and DH meeting to talk business. They speak in English for a moment (to see which one is more educated?) and go inside and the hotel to talk business about shares. DH is offering 51% of the company. CA thinks that is pretty insane, he could kick him out of the company if he does that. DH says his only condition is that there should be no SB involved. At a cafe, SB meets with JY to talk about the musical. SB wants to help JY pick an actress because he has been thinking about it for awhile now. She thinks he should not worry about the casting choice and should just worry about his work. She can take care of casting. But she does not want him to tell DH. JY goes to his team and tells them that he only wants one actress as the main, not two. The main actress is one character and JY wants to move MC as the replacement for her. His team thinks he is going crazy, they always have two leads. But he jsut smiles and leaves. The scene changes to MC practicing her musical singing skills on the piano with DH watching her secretly. He thinks it is good enough that she doesn’t have to practice anymore. She asks when he came. he says not that long ago, he wants to eat with her since it is 9 am. They go off together. RH is at home looking at all the expensive things that they were given. The brother wants to know if she took the money. Umma won’t tell her. But if her son takes her somewhere then she will tell him. Meanwhile, MC and DH walk to eat. Dh asks her if she is nervous, MC says she isn’t nervous. He tells her not to worry and to get the part. PWJ is behind them making all sorts of facial expressions. But he gets found out and makes himself scarce. MC and DH hop into the elevator without PWJ. She immediately notices that her time is adding again. then she sees DH’s clock! She tells him that she aw his clock and she starts looking at his neck to find it again (it dissapeared). It looks a little romantic to an outside viewer, so when JY gets on the elevator he can’t help but wonder what they are doing. MC tries to play it off. Later on she freshens herself up in the bathroom and tells herself that she shouldn’t be nervous. Cut to the audition. Several people are at a judging booth listening to four women singing the musical in front of them. MC’s voice stands out among the four ladies. JY cuts one of the women, the others keep singing. he walks around listening closely then cuts another one. There are only two left. Now the two women left will take turns singing each line back and forth. The other woman is really good. They sing back and forth for a minute until JY tells his first assistant that she can make the decision. Everyone is shocked. Afterard, we have a nice moment where SH runs into WJ and hurts her arm. he is MC’s brother. SH immediately starts beating him like she has known him forever and practically spanks him all up and down the hall. Then she gets ahold of herself and asks him why he is there. Cut to MC’s mother talking to DH. DH is pretty nervous about this situation and listens to umma intently. Umma tells him that the reason she is there is to tell him not to see her daughter. She gives him some money and sets it on the table. Then she tells DH that she does not want her daughter to date in this family. She explains about the guy that came to her house. She was very angry. She has seen a lot of cheabals with power, when they are bad, they can be very bad. Even if your family welcomes my daughter, I will not let my daughter marry you. I am not a good mother, but I am still an Umma, I won’t let it pass if anyone harms my daughter. She leaves in a huff. In the hallway, she wonders if she did a good job. Was it enough money? It was all her money. Where is my son? She walks around the corner and runs right into SB. RH immediately starts talking to SB about her purse, 1955 Chanel limited edition. SB tells her she has great taste for recognizing this. SB walks off leaving Umma spinning. Umma wonders if she should have taken the money after all, but she comes to her senses and says no, it was a good idea. MC gets the lead spot! The other woman is under her. JY’s assistant tells them all to do a good job. It looks like she is the lead sub, perhaps? Maybe not the lead actress. Or maybe the lead actress, not sure. SB goes into the room then and asks MC if she wants to drink coffee with her. Meanwhile, DH storms into his brothers office and tells him that he knows he is the one that gave MC’s family that money. His brother just tells him that he made a deal that was all beneficial to him so he could not refuse it. DH tells him that he came here to warn him, don’t be hasty. It won’t be easy to keep the position. What you do it really cheap, I am not going to do things like you. I am going to take you down with my ability, you said you know my weak point? then touch it. he leaves. MC and SB go to a bar to drink soju and beer. The atmosphere is tight as they both drink first. Then MC speaks. She tells SB that she is better than she expected. SB tells her that it isn’t good timing to tell her that everything is done. So you are living in DH’s house, does that mean I am out? I told you I dont like makjangs, but you make me like I am in a makjang. They talk back and forth about going too far. SB tells her that she needs to leave that house to find out what “too far” really is. She will break with waves and storms. She will show her how fragile her heart is. You should help me so that I don’t have to spray water on your face or slap you. She leaves gracefully. MC leaves as well and walks up the street. She thinks about MC. He speaks in her mind, he is happy that she is with her and wishes time stopped. She thinks about SB as well and especially when SB told her not to be like a prostitute and leave that house right now. DH calls but MC does not pick up. He texts her and asks her where she is and why she isn’t picking up his calls. She tells him that she is right in front of the company. he asks her where? She tells him she is at the bus station, she will take the bus home. But he poofs right next to him like he’s in Harry Potter. he says he wondered what happened to her. She asks if he would like to take the bus. He hopson the bus and pulls her along as they interlock their fingers. While riding he tells her that it feels like a dream. He had a lot of tired things today, but sitting with MC….he feels strange. he asks her if she talked to her mother yet, whatever she says, don’t run away. Don’t run away unless his heart changes (or her heart?). She tells him that she wanted to run away today. he asks why. She tells him that he is a very different person than her, he lives in a different world and has a fiance who is super scary. Dh tells her not to meet SB, tell him first. MC tells him that everything was fine, but what she said was truthful. That made MC scared and it made her want to run away. But when she looks at DH, she can be brave and fight. She forets about all those other things. Am I too selfish? He is sorry that he made her feel like she should run away. Don’t be scared, I will do a good job, I will protect you. Sh took MC’s brother to grab something to eat. She is super annoyed at him and is only doing this because he is her dong-sang through her best friend. But what she really wants to do is hit him. he tells her that he will tell her why his mother went to her place, just let him eat all his food first. SH is so annoyed and deides to bury her frustrations in a liter of beer. Cut to clothes lining the floor. SH is in bed and looks to her left. The brother is in bed with her! She yells at him, i-nom-ah! The brother is all like, why are you hitting me? But then he looks around and wonders what is going on, did I sleep here? It dawns on him that they might have slept together. Soon after, we see the brother kneeling on the floor in front of SH. She yells at him about drinking too much. She told him to stop drinking! The brother says it is a mistake, she is mistaking everything. He always takes off his clothing when he drinks and then he would get in bed, of course. She asks if he is sure. he says, yes! i’m sure! i would never do anything with you, you raised me! SH thinks about it. MC tells DH to take it off. he looks shocked and asks, right now? She asks him if she wants him to take it off for him? He nervously tells her that he will do it. He starts unbuttoning his shirt, but he takes forever so MC just turns him around and pulls his shirt down partially. She looks at his knife wound and starts dressing it. But she is a little sad because she thinks it will leave a scar. He thinks no one will see it anyway. But then their eyes lock and he leans in as if he will kiss her. She closes her eyes which makes him ask her waht she is doing. She hits him on the back in frustration but she hits his knife wound so he hops in pain for a moment which makes her apologize. His nice brother comes in at that moment and tells DH that he is going to go see a pretty woman. He meets up with his sister in law. It looks like they are friends with each other. HY tells him to come home, his appa misses him. DS doesn’t really believe that, he asks how his other brother is and comments on how he wants to tell her parents that he was the cupid that set them up. HY tells him that she wants him to get married first. he tells her that it would be difficult, he has too many women following him around. They start to talk about how HY lives. HY says he lives well, he is also concerned about his abonim and wants to live nicely for him, but there is a little bit of sadness in what he says. He tries to hide it with a smile. DH angrily walks up to PWJ. He is upset at being out of the loop about the musical. He wants to know who the main character of the show is. DH storms out and goes to meet with JY. They immediately start to argue about who is polite and who isn’t polite. DH wants to know who is cast as the lead right now. JY is nonplussed, he does not care a flip about what DH wants or does not want and just tells him to wait for it. He says all of this politely though so DH can’t really get that mad at him. Everyone stands and introduces themselves around the script reading table. But the lead female character is not there. JY tells them all to not worry about it, she will introduce herself later, she is a little late. MC leaves the reading and catches the elevator. She meets DH in the elevator where he tells her that she should tell her if she wants to be the main, he can do anything for his woman. He was born as a 3rd generation cheabol to help hiw woman realize ehr dreams. But she says she will do ti herself. DH agrees and says he does not like that stuff either. They get off the elevator and walk off. But then everything stops as we see the feet of a woman, then we pan up and see DH’s reaction to this woman, he is not happy to see her. MC looks from him to her. SB walks up at that moment and sees the both of them together. She also looks from him to her. MC looks at her time on her wrist. Her time is stopped, but then is starts to tick again. She has 86 days left and counting. The ex has returned and it looks like DH still loves her. Oh nooooooos! Previous Post Premiered: Are You Human, Too?